All Star Game 2012 Final Vote time is upon us (ballot here). It's good to see MLB at least trying to connect casual fans with stats. In an effort to more clearly look at the cases for each player, let's pick out a few other stats that could enlighten the discussion. teammate, Dan Uggla, in KC. 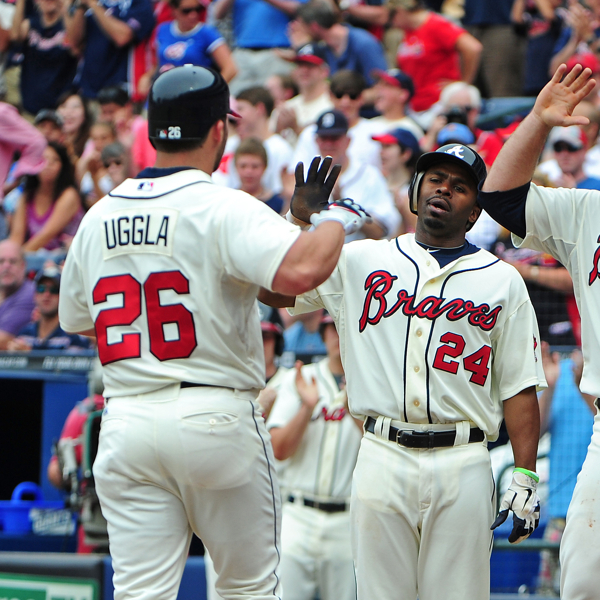 Starting with the National League, at first glance, Michael Bourn has the clear inside track. 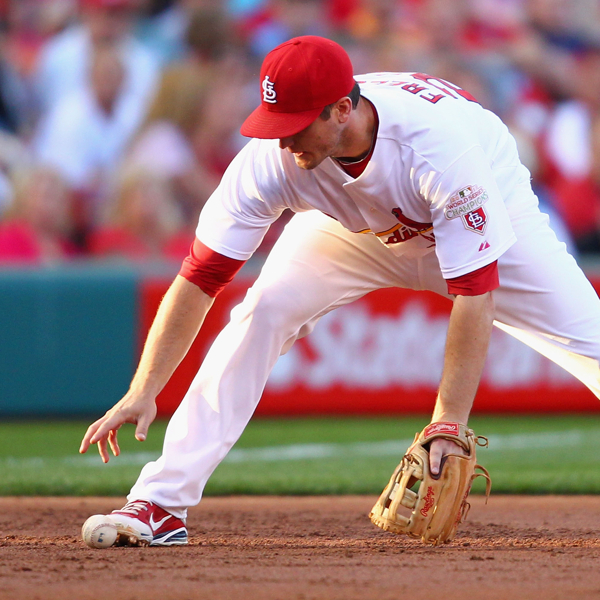 He leads the group in Batting Average, Runs (by a lot) and Stolen Bases (by a lot more). The Braves center fielder also looks like a solid choice, considering he leads in Wins Above Replacement and Runs Above Replacement on both Baseball-Reference and Fangraphs. 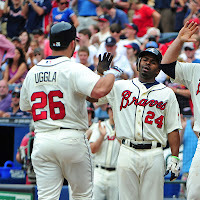 The Braves have two nominees, as Michael Bourn is joined on the ballot by his teammate, Chipper Jones. The 19-year veteran is the sentimental selection among most fans, sportswriters, and other players. He's battling through injuries, and the distractions of being in 1989 Kareem Abdul-Jabbar farewell season, to post excellent results when healthy. Fans from all parts have been showing their admiration. Even through inter-league play, fans in Tampa Bay gave him a standing ovation, while the Yankees surprised him with a framed 3rd base from Yankee Stadium. Chipper may deserve the votes, from a nostalgia perspective, but to give him a case using stats, he has the best OBP, Win Probability Added, BB% and K% among the five finalists, and is tied with Aaron Hill for best wRC+ at 130. Aaron Hill is seeing the ball well. It's important, when looking at counting stats, to note that Chipper Jones missed a lot of games due to health, and Bryce Harper was facing Minor League pitching in April. By mentioning Aaron Hill's "balance", we're not talking about the aesthetics of his swing. What he has shown is an ability to him more pitch offerings than his counterparts. The hitters on this list have done most of their damage on fastballs and curveballs, while struggling with sliders and changeups. Hill has positive Pitch Values versus five pitches (FB, SL, CT, CB, and CH). 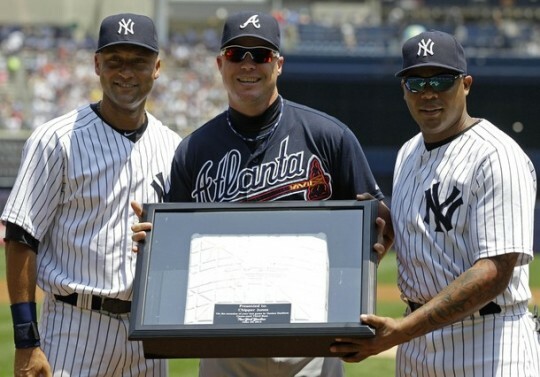 Chipper Jones has had success versus four (FB, CT, CB, SF), and the rest of the group no more than three. Aaron Hill is an interesting choice, who may be most deserving of votes, but will probably end with fewer votes than the fan favorite phenom from DC: Bryce Harper. 19-year old Bryce Harper is a thrill. The National League's version of Mike Trout is an exciting player to watch, with prodigious bat speed, power, a rifle arm, and exuberant hustle on the base paths. The last #1 Overall pick to hustle down the first base line on all balls put in play as much as Bryce Harper was Shawon Dunston, who was drafted in 1982. Unfortunately, Bryce Harper's success on the baseball field has not resulted in a lot to show statistically. Harper has done most of his damage against fastballs, but he swings at the highest percentage of pitches (both inside and outside of the strike zone), with the lowest contact percentage in the strike zone of the entire lot. He has the lowest fWAR and is the only player with a negative RE24 quantity. In Baseball-Reference's WAR calculations, Bryce Harper only surpasses David Freese, who has a virtually nonexistent case to garner votes. The defending NLCS and World Series MVP won't have to buy a drink in St. Louis ever again, but he shouldn't be the 25th man on this year's NL All Star Team. Freese is the worst base runner in the bunch and is the only one with a negative WPA. His Contact percentage (74.4%) is the worst in the group, while just a hair ahead of Harper's 74.5%. By comparison, Aaron Hill leads the group with an 86% contact rate, while the league average is around 81%. David Freese has no business being on this ballot. Switching gears to pitching, and the American League ballot, we are looking at three starters and two relievers. I don't believe we need to worry about how the choice affects the construction of the AL pitching staff, rather focusing on which player is most deserving. Right away, I can throw out Jonathan Broxton's name. Not impressed by the 20 Saves, if you're going to make this team as a reliever, you'd need K/IP numbers and an ERA more in line with Ernesto Frieri. Starting Pitching is inherently more valuable than relieving because of the ability to produce more value by completing more innings pitched for your team, as well as showing the ability to fool major league hitters multiple times in the same day. Ernesto Frieri will need to have stats that blow away the starters he's competing against on the ballot. Jason Hammel, Yu Darvish, and Jake Peavy each have strong cases. 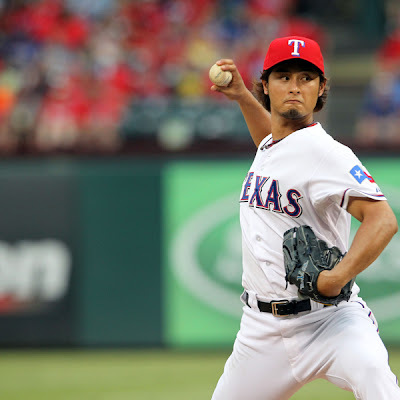 Voting for Yu Darvish will be attractive to those who side with MLB's old stand-by pitching stats: Wins and Strike outs. He has the most strike outs in the group, and his 10.3 K/9 unsurprisingly leads the starting pitchers. Frieri paces the group at 15.0 K/9, while Broxton trails everyone with a puny 6.8 K/9. Jason Hammel will be popular among those who lean on xFIP, SIERA, and GB%, as the Orioles' hurler leads the group in each. One of this past offseason's best trades was on February 6th, when the Orioles' General Manager, Dan Duquette, sent Jeremy Guthrie to Colorado for Jason Hammel and Matt Lindstrom. 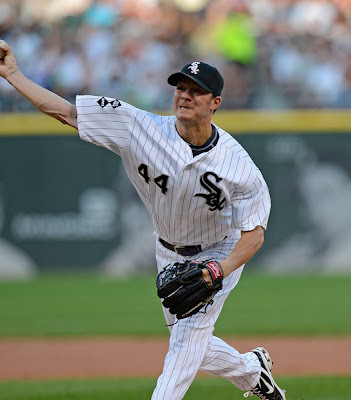 On the South Side of Chicago, Jake Peavy is having a magical season, leading the group with a 4.21 K/BB ratio, 5.4% BB rate,as well as both Wins Above Replacement measurements (B-R and Fangraphs). Not that it matters for voting purposes, but beware of Peavy's future, as he is surviving with a 35% GB rate and 7.6% HR/FB (Career 9.3, with most innings at Petco Park). We don't often support the White Sox, but Peavy gets our vote. Does one of these starters done enough to outshine Frieri's accomplishments? Sure, it's only one or two innings at a time, but his 41% strikeout percentage is holy. His .132 Opponents' Batting Average shines, and - again - that 0.75 ERA is brilliant. In the end, we are going to vote for Aaron Hill, as he also leads the NL group with a .371 wOBA, 130 wRC+, and 1.6 WPA/LI. On the American League front, Jake Peavy is getting our vote. We didn't let our Chipper Jones sentimentality get carried away, with our last choice, but some of what is driving us to Jake Peavy is to reward him for coming back from a career threatening injury. 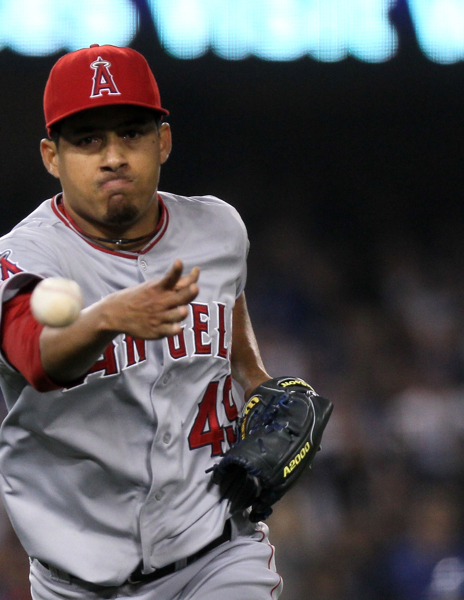 He has thrown a much higher First Strike % than his counterparts and also leads his peers in RE24, REW, and WPA/LI. Like a Bush campaign, Darvish will get support from Texas and Overseas. Who's getting your vote? Harper and Darvish? That's who we expect will win.